The lychee is native to low elevations of the provinces of Kwangtung and Fukien in southern China, where it flourishes especially along rivers and near the seacoast. It has a long and illustrious history having been praised and pictured in Chinese literature from the earliest known record in 1059 A.D. Cultivation spread over the years through neighboring areas of southeastern Asia and offshore islands. Late in the 17th Century, it was carried to Burma and, 100 years later, to India. It arrived in the West Indies in 1775, was being planted in greenhouses in England and France early in the 19th Century, and Europeans took it to the East Indies. It reached Hawaii in 1873, and Florida in 1883, and was conveyed from Florida to California in 1897. It first fruited at Santa Barbara in 1914. In the 1920's, China's annual crop was 30 million lbs (13.6 million kg). In 1937 (before WW II) the crop of Fukien Province alone was over 35 million lbs (16 million kg). 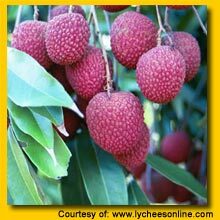 In time, India became second to China in lychee production, total plantings covering about 30,000 acres (12,500 ha). There are also extensive plantings in Pakistan, Bangladesh, Burma, former Indochina, Taiwan, Japan, the Philippines, Queensland, Madagascar, Brazil and South Africa. Lychees are grown mostly in dooryards from northern Queensland to New South Wales, but commercial orchards have been established in the past 20 years, some consisting of 5,000 trees. There are only a few scattered trees in the West Indies and Central America apart from some groves in Cuba, Honduras and Guatemala. In California, the lychee will grow and fruit only in protected locations and the climate is generally too dry for it. There are a few very old trees and one small commercial grove. In the early 1960's, interest in this crop was renewed and some new plantings were being made on irrigated land. At first it was believed that the lychee was not well suited to Florida because of the lack of winter dormancy, exposing successive flushes of tender new growth to the occasional periods of low temperature from December to March. The earliest plantings at Sanford and Oviedo were killed by severe freezes. A step forward came with the importation of young lychee trees from Fukien, China, by the Rev. W.M. Brewster between 1903 and 1906. This cultivar, the centuries-old 'Chen-Tze' or 'Royal Chen Purple', renamed 'Brewster' in Florida, from the northern limit of the lychee-growing area in China, withstands light frost and proved to be very successful in the Lake Placid area-the "Ridge" section of Central Florida.